"Are you still on Facebook?" "No, I'm applying to the Peace Corps." "You can't stay on our health insurance once you graduate." "What about your school loans? "You get a deferment when you're in the Peace Corps." "Shouldn't you look for a real job?" "This is a real job." "I've been thinking about it for awhile." The Peace Corps? She just spent a small fortune on a college education. Didn't she want a job that would...well, let's be honest here: give her financial security? A chance to use her gift for writing? Provide a nice place to live (a place that didn't require that she take daily malaria pills, at least)? That's when I left to read Mari's book. I couldn't deal with this Peace Corps plan anymore. The first page of Do What You Love laughed at my definition of a "good job" as just being something that gives you financial security. "Your career is a big part of how you spend your time and, consequently, who you are as a person," writes McCarthy. 'It's just a way to pay the bills' doesn't ring true when it has such a profound impact on other areas of your life...it's important to find a job that aligns with your passions, values and strengths." 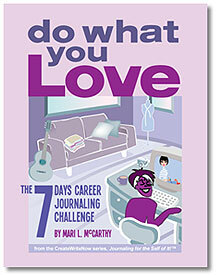 If you're out of work, unhappy in your job, or just ready to move on to a new phase in your life, Do What You Love: 7 Days Career Journaling Challenge is a great way to start exploring your options. This intensive week of journaling doesn't just focus on specific jobs. Instead it addresses everything from your childhood beliefs about what a job should be to what you want from a job to what makes you happy. This book could be just the inspiration you need to find your true calling. I'm really excited about this challenge. I'll be sharing it with my friends. Sounds interesting, I'll check it out. Thanks!